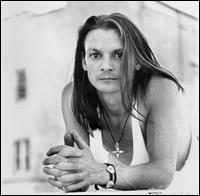 FOREWORD: The late Chris Whitley was a magical guitarist whom I was mesmerized by at the Knitting Factory in ’95. By that time he had become inspired by New York’s growing noise rock scene. Prior to ‘97 s Terra Incognita, I met Whitley at a lower Manhattan café to shoot the breeze. He was sincere, forthright, and smoked a lot. Tragically, lung cancer killed him by age 45. Up to his untimely demise, he had continually put out great, yet under-recognized, albums. They include ‘98s earthy Dirt Floor (done in a Vermont log cabin), ‘00s Perfect Day (a covers LP done with Medeski Martin & Wood’s rhythm section), ‘04s poignant War Crimes, ‘05s Soft Dangerous Shores, and ‘06s Reiter In. This article originally appeared in Aquarian Weekly. Immersed in mythical imagery and obsessive pathos, New York-based singer/ guitarist Chris Whitley smears obscure visions of Americana across desolate terrain. At a young age, his art-directing father and sculptor mother provided encouragement and support, allowing their son the freedom to develop his muse. A self-described “undisciplined musician,” he quit high school, became a street minstrel (way back in 1971! ), and spent a few years in Belgium before releasing his critically acclaimed ’91 electronic folk gem, Living With The Law. Following a four year hiatus, Whitley managed to put the restrained acoustic atmosphere of his debut aside for the abrasive, distortion saturated Din Of Ecstasy, an enterprising second set somewhat akin to the noise-rock experiments Neil Young managed on Freedom and Ragged Glory. He may’ve lost some of his less adventurous fans in the process, but its challenging 6-string prowess was undeniable. On his latest, Terra Incognita, his slightly nasal baritone gently wavers in the wind, giving each original song even more distinction, clarity, and genuine sense of purpose than previous efforts. “When I quit school, I was screwing around with semi-bluesy Muddy Waters/ Led Zeppelin/ ZZ Top stuff. I had practiced sight-reading and sight-piano but never kept it up. Instead, I learned the hard way – by playing notes and writing songs. I never found out where scales fit in nor was I theoretically inclined. But structurally, my music and lyrics are the architect of dynamics. I always believed the second verse could do as much as an inverted chord, but I had no practical note knowledge,” Whitley admits. At age 17, his mother gave him $200 to go to New York, where his father would visit him from Vermont on weekends. Playing for change at Washington Square, Whitley worked at a deli before getting a gig at Mills Tavern in the Village. Living in girlfriends’ dorm rooms and sometimes in the park, he broke down and rented an American Legion Hall “closet” for $130 per month by the time he was 21 years old. He moved to Europe and played blues-y funk in a contrived band, then made an independent record overseas that he claims “naively tried to be groovy mixing Ultravox with Kraftwerk using analog sequencers and Fairlight synthesizers.” After six years in Europe, he decided to go back to New York. He worked at a factory job and got a basement apartment for his Belgian wife and daughter. Hiring Burn to produce his stateside debut gave Whitley confidence, though he has a few misgivings about the project. He enjoyed the bleak, desert-like sound Bill Dillon played on the majority of guitar parts,but retrospectively, the lush tone could have been edgier for Whitley’s taste. With his marriage dissolving, Din Of Ecstasy became a personal statement about internal conflicts. Its blues-y metallic intensity and complicated structures gave it an edgy, unsettled feel. Closer to the misty seclusion of Living With The Law, the brilliantly conceived Terra Incognita is Whitley’s most accessible, stable, and well constructed disc yet. Led by the woozy Dylanesque opener “Power Down,” the balmy, dramatic “Automatic,” the sonic retreat “Weightless,” and the implosive “Clear Blue Sky,” he whittles down each vignette to its bare essence. The spliced harp on the skewed “On Cue” and the creepy banjo on “Still Point” add spice to acoustic arrangements. 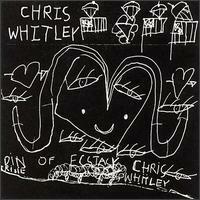 As for his new songs, Whitley offers a few excellent assessments.